This past weekend, I taught on the 2nd Article of the Creed at a confirmation retreat. In preparation, I was given a nifty booklet with the whole lay-out of the lesson. Since I only had an hour to teach, I had to skip a few details. So I tried to emphasize some of the main points. The booklet separated the various parts of the 2nd Article. After beginning with “And in Jesus Christ His only Son our Lord,” it continued with “who was conceived by the Holy Spirit;” the next one said, “born of the Virgin Mary,” and so on. Each of these parts included historical explanations for why they were significant to mention in the Creed. The booklet mentioned the Gnostics who claimed that Jesus was not the Christ until His baptism, but then the Christ left Him before He was crucified. I found these all very useful and interesting to teach the kids. When I got to the part, “suffered under Pontius Pilate,” I read the familiar explanation that it shows that our faith is grounded in history. This is something I had learned before, and again, I thought it was useful. But then it hit me. The fact that the Creed mentions Pontius Pilate expresses yet another great significance. 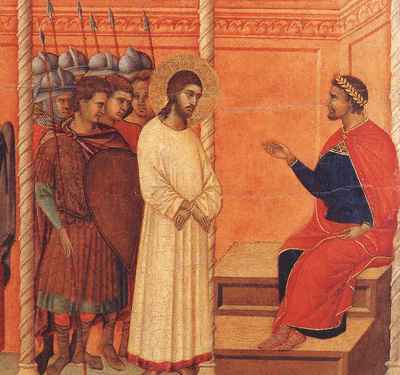 God worked through Pontius Pilate to carry out His justice on Christ, and thus on the whole world. As The Apostle Paul says, “One died for all. Therefore all have died (2nd Cor 5:14).” Through baptism, we also die the righteous death, and we therefore rise victoriously with Christ (Rom 6:3-11). That official act of judgment and justice which is grounded in history is credited to us through faith in the one who died and rose again (Rom 4:24-25). The fact that Pilate declared Jesus faultless yet continued to hand Him over to crucifixion was not just an irony. It was what needed to happen. By His Divine Tribunal, God declares us righteous for the sake of his Son’s holy precious blood and innocent suffering and death. So when we confess that Jesus suffered under Pontius Pilate, we should not only keep in mind that Jesus’ death is grounded in history. We should also be reminded that Jesus’ death was a righteous judgment that God carried out through His temporal servant. It was the justice needed because of our sin, and God accepted such justice. We continue to confess it in the creed. God proved that it was truly justice when He raised Jesus from the dead. Jesus’ legally ordered death gave God justice; it propitiated Him; it appeased Him. So through faith in Jesus’ righteous suffering and death, God forensically imputes to you Jesus’ obedience, declaring you fully righteous for His sake. Andrew, this is excellent. I really enjoyed it. Mainly because it is so true, but also because it is well written. Thanks a lot! Intentionally focus rubber-meets-the-road method	adjustments.